We’ve been doing a lot of pull tests and drop tests lately, validating the operating parameters of our TRACE™ Comprehensive Capability Micro Rope Systems. During a day of testing, I thought I would pull some Raptor™ Buckles to destruction and measure peak forces, just out of curiosity. We’ve been using Cobra® Buckles on our X-Belts™ and M-Harnesses™ since the beginning and, keeping an open mind for alternative possibilities, I wanted to validate the Raptor™ personally. There has been some controversy around them and I figured the best way to sort it out was to to see for myself. It’s worth noting that the testing we did was completely independent. The buckles were free samples from the sales rep, however when providing them, no one intended them to be used for testing. We were not asked to test them, compensated for the testing, nor have we provided JBC Corp. or AustriAlpin directly with our test data. This was strictly for our own information. We pulled 2 x new, 1.75″ Raptor™ Buckles. The first one we tested in non-adjustable configuration, direct pull, meaning the webbing was not threaded through the existing ladder lock bar, and the pull was directly on the buckle, not sharing the load on a second webbing leg of a loop. For the sake of comparison, this is the same buckle configuration that J.H. Holland conducted the testing on (they also did not thread the webbing through the ladder lock, but rather placed it over the ladder lock bar). They, however, configured it in loop configuration, meaning a second webbing leg supporting (theoretically, doubling the load capacity) of the total webbing loop, with the weak point still being the buckle. Note that the ladder lock is not threaded. This is not the configuration of function. On the Raptor™ Buckle website they state they are rated to 18kN, though they don’t mention (and it is important to understand) that is in ‘loop’ configuration, meaning the buckle leg is only taking half the load. In direct pull, which is how we tested them, the rating is 9kN. They also state that the average peak force during destruction testing on the 1.75″ buckle is 24.4kN in loop configuration. From that, one could extrapolate and hypothesize that a direct pull would have broke at ~12.2kN, or half the force. These tests were conducted on contract by J. Henry Holland Corp for JBC Corp, the OEM Distributor of the buckle (manufactured by ADF). Our testing broke the buckle at a peak force of 9.451kN, failing at the opposite side of the ladder lock (female side) at the corner rivet points, shearing the aluminum plates. Which granted, is above the rated load of 9kN, though it’s not even close to the extrapolated rating from the J.H. Holland testing of 12.2kN. So it begs the question, why such a difference? Of note to mention, we did not pull the buckle to the rated load and hold it for two minutes before pulling to destruction as the J.H. Holland test did either, which is a more aggressive test. We also pulled ours with webbing wrapped around the frame not the ladder lock bar, however the buckle broke on the opposite side of the buckle, so that factor becomes irrelevant. The next test we did was in ladder lock configuration, which is actually the configuration of function/operation and, in my opinion, how the buckle should be rated. It is worth noting that the J.H. Holland testing did not test the buckle in this manner. I had anticipated the webbing being cut because of the sharp edges of the bar and frame in the design. To my surprise, the webbing did not break, but rather the buckle broke by the ladder lock bar bending the frame and the frame failing at 6.981kN. This is well under the 9kN rating. What we didn’t do was an apples to apples comparison yet. I’ve referenced the Raptor™ Buckle claimed strength, so I’ll reference AustriAlpin data. They actually have data from internal testing in ladder lock mode where they did 12 test samples. The weakest of those samples in ladder lock mode broke at 10.8kN, well above the 9kN rating. Other differences that we noted that contributed to our decision to stick with the Cobra® Buckles included the fact that the springs of the release tabs are visible in the Raptor™, thus exposed and prone to corruption. When we compared that to the Cobra®, they had much tighter tolerances in their fabrication and assembly noted and no visible springs or ‘wiggle’/’play’ in the tabs, resisting foreign corruption from fowling the mechanism. And fairly obvious, the riveted plating gap on the Raptor™ also allows for debris to collect inside the buckle between the two plates. The Raptor™ also had a much wider profile, most likely due to the hollow plate design, making threading through belt loops much more challenging. The Cobra® aesthetic is more appealing to us, and AustriAlpin Inc. has been making the Cobra® Buckle for a very long time, making them tried, tested and true. We encourage critical thought when evaluating components of any life support system, including scrutiny of this testing. We only pulled one test sample in each configuration without a direct comparison test to the Cobra® Buckle, so take that for what it’s worth. If you’d like us to test buckles or micro rope systems in configurations that have not been done, and are relevant, we’ll certainly entertain your ideas. Please send them to us and we’ll see what we can do, and let us know what you think about this or other testing that we’ve conducted. I too had bought into the Raptor buckles, mainly so that I could offer my customers another option, but I have since changed my mind, due to the buckles not selling and concerns with quality. This information that you have provided is just another reason I am glad with the decision I have made. I have used AustriAlpin Cobras from the start and they will be the only buckle I offer from now on. Very cool test! Very interesting results too. I’ll be sticking with Cobras as well. Just out curiosity, it’d be fun to see the break points of the Cobras. I have a feeling they’ll be a bit higher. 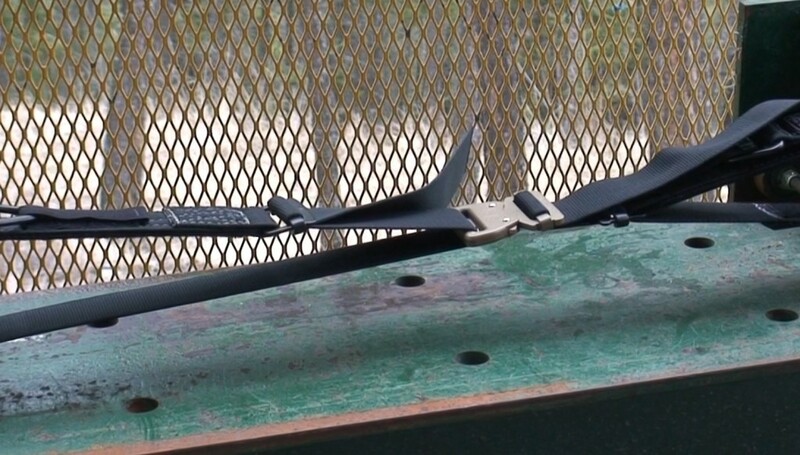 As mentioned in the article, AustriAlpin pulled 12 test samples in the same configuration of their Cobra buckle, and the weakest failure was above 10kN. We’ll see if we can get around to doing our own on the Cobra, but there is a ton of validated data out there on them, it didn’t seem necessary. I think it is worth noting that on the buckle itself (1.75″ Raptor) it has both ratings for looped configuration and single strand configuration (18kN and 9kN respectively). It does, but it broke a 2kN under the stamped rating. Has the manufacturer been notified of these findings? I have received samples of the Raptor buckles in the past but the quality and design did not meet our standards for our products. The Cobra buckles from AustriAlpin has met and surpassed our expectations in quality and compliment our tactical products very well. We will only use their buckles in our manufacturing. Thank you for validating their quality and confirming our decision was a good one. 215 Gear™ stands on it’s commitment to sourcing and utilizing the finest materials available in the marketplace. 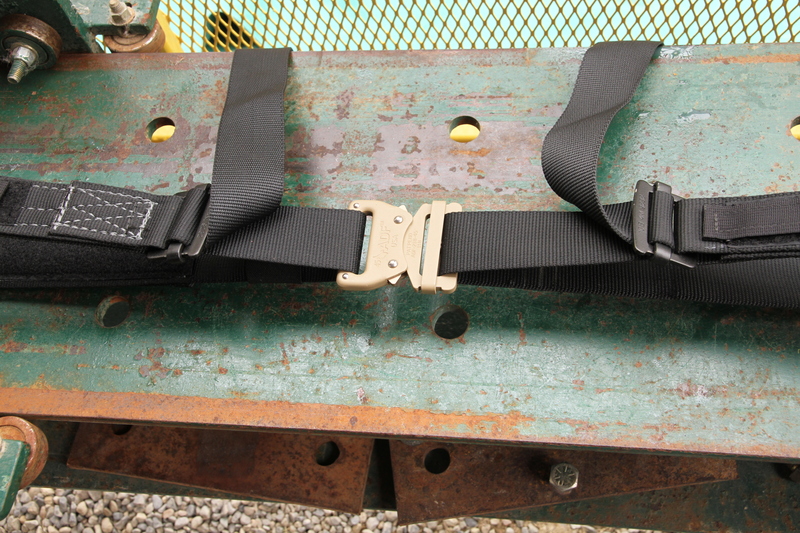 From the start of our company and one of our first products to the public was our Ultimate Riggers Belt, in 2009. We sought out and sourced the best component on the market, the AustriAlpin Cobra Buckle. From the start, the fit, form and function was impressive; with their customer service second to none in the industry. With many years together and several custom projects together, both companies continue to provide the best products in the industry. We are additionally proud to call their team close friends of ours. Found this whole thing to be very interesting. I know you guys only tested one each way. I’m interested in the test setup just from a personal/academic interest standpoint (none professionally). I was wondering if you had factored in the possible fatigue loading the “slips” produced in your tests where the test stand seemed to slip down the track. Could have an impact, although probably not a large one. Curious as to what are you using to get measurements, calibration info and what’s your uncertainty? Obviously no repeatably from one test, but a failure is a failure and that’s a little scary. I’m all for ‘back of the envelope’ empirical tests because sometimes you just have to do it yourself. Especially when the applications are the ones CTOMS designs for. I know it’s not common to publish safety factor data, especially on load systems as people might be tempted to push things, but a 5% safety factor seems pretty small for the single pull configuration. It perturbs me why the manufacturer wouldn’t test the ladder lock configuration as it is the configuration of use. Always been impressed with your products, keep up the awesome designs! There was no slipping or significant shock loads prior to the testing. The bumps you see the carriage make would not have affected the buckle strength in any way. Force was measured with a load cell rated to 10,000 lbf with a current calibration certificate. To be honest, I don’t recall what the sample rate was set at but it was set to measure peak force. I also dont recall what the uncertainty rating is for the load cell, but its a high quality block and its relatively new, operating at its mid range so I would imagine its pretty tight and accurate. All our other test data that day was consistent with previous testing with a different load cell. Thanks for the info. Always interesting to see how other people do it. Didn’t think the slipping would have affected anything significantly. I’m a big believer in transparency in testing, not much gets better than your video for the layman. Nice job documenting, although now I’m noticing a distinct lack of documentation from the OEM on these new buckles, which is scary. Almost as scary as the below speck ladder lock break. I’m kind of seeing why you decided to put them to the test. Glad you did and thanks for sharing the results of the tests. Maybe the manufacturer will fix whatever issues are there, or maybe not. I won’t be hanging from the new ones one anytime soon though. We are accustomed to seeing a surge of negative chatter from our competitors whenever we experience an increase in sales and presence in a new market. Seemingly, the posting of negative comments is motivated by self-interest and the desire to preserve market territory. However, it is irresponsible to post biased and unsubstantiated statements about competitor products. Our most recent testing is published on our website, http://www.raptorbuckle.com and speaks for itself. We offer the following in response to CTOMS claims and testing. Two 1.75”/45mm samples were given to Chris at CTOMS 2 years ago. Apparently, the need to quickly test the samples two years later did not allow for time to conduct a thorough and documented evaluation. It could be disputed that two buckles are not a large enough sampling and where have the buckles been in the past two years is unknown; whether they have been used or if they have been damaged. These are just a few critical factors in conducting a valid evaluation. But most critical, is that testing was not conducted to conform to the manner in which the buckles are intended to be used. The most common use for this type of side release buckle is belts, body harnesses, and slings all of which uses the Looped or indirect configuration. The buckles are marked for 9Kn/2000lbs indirect and 18Kn/4000lbs direct, all which are explained on our website above. We will be doing some more testing of the direct configurations soon which will be placed on the above website. Check back in a few weeks for our published results. Our “Critical Use” customers, to include the Army, State Department, Oakley, and others do their own testing. Regardless of testing conducted by our customers, testing has been conducted on every lot manufactured first. Finally, the design of the Raptor was based on the Presto Buckle design, in cooperation with the parent company. We firmly believe “Made in the USA” is important. In fact, it’s more important than you think, for many reasons. Anyone with questions about the RAPTOR that doesn’t want to hide behind a screen name can contact me directly at 757-697-0019 or ocazares@jbccorp.com. Octavio, thanks very much for replying here. I’ll reply in kind to some of your comments directed toward us. We were in no ‘hurry’ to test these buckles as you imply. The opportunity arose, so we conducted the tests, not formally, but out of curiosity. That is fully disclosed in the article. The only documentation that was important to us was to measure MBS. I’m not sure what you are referring to as not thoroughly documented. If it is in regards to the sampling rate, though I can’t recall what it was at the time, I assure you it was not manipulated to give false readings, and was consistent with our other testing of our own systems done that day. Sampling size is irrelevant because I don’t want to be the guy that buys the one in a million buckle that wouldn’t have passed quality control. If I pulled 100 buckles, a million buckles, and one broke 2kN lower than the stamped rating, I’d be concerned. Please send me your best quality buckles and I’ll repeat the tests. The article states that the buckles were new when tested. I’ll also reassure you that the buckles were undamaged when tested (that is what new means). I don’t appreciate your insinuation that we would manipulate the buckle or use a damaged one to give a biased test result. Our integrity and reputation stands for itself, and questioning it reveals an insecurity on your part. At no time did we have any intentions other than noting break strength of the buckles for our own interest sake. The blog post was to let our customers know why we choose the components in the products that we do, and not others. It was not an emotional or marketing motivated post, but rather simply stating facts about testing that we conducted for our own curiosity. Opinion stated in comments on the article are that of the poster and not CTOMS’. Your explanation and description saying that they were not tested in the way they are intended to function is actually incorrect and shows a misunderstanding of force application and testing in general. 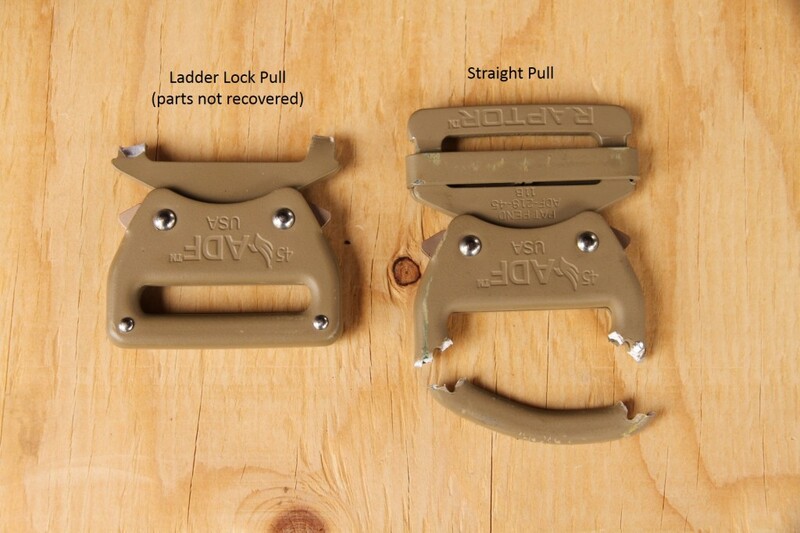 Even if intended application is in loop configuration, there is still a stamped rating for direct pull, which in ladder lock configuration, failed 2kN below the stamped rating in our test, on a new, undamaged buckle. All a direct pull does (compared to a loop config pull) is reduce the amount of force required to break the system by about half, and is a better way to test if you can isolate the weakest point of the system. Testing a manufactured harness or belt with the buckles incorporated would be conducted completely differently, including using a torso manikin and should be done product design specific. And I do apologize if this is getting into the minutia, but to be accurate in your descriptions, as you are presenting a critical argument on a technical subject, it is not “Kn”, it is “kN” and is not “lbs” but “lbf”. Your buckles are marked 9kN Direct and 18kN Indirect (you mixed that up in your comment above, an honest error). I couldn’t find anywhere in your posted test results, a ladder lock configuration pull test, so I’ll be interested in your new test result if you conduct and post them. My question for you though, is will you actually post them if the results are consistent with our test result? Probably not as that would be product suicide, so it will be interesting to see how this plays out. Personally, it doesn’t matter to me if you do the testing in direct or loop, as long as the buckle is in ladder lock mode, which is configuration of function. I can discern the difference. And quite honestly, at this point, there are other factors explained in the article that from our perspective, make any additional testing irrelevant as we’ve come to our conclusion as to the best buckle for our requirements for reasons other than strength. I also haven’t seen any independent data published anywhere by DoD, Oakley or others, so if you’re able to make that available, I think a lot of people would be interested in that as well. Independent data is the best kind.